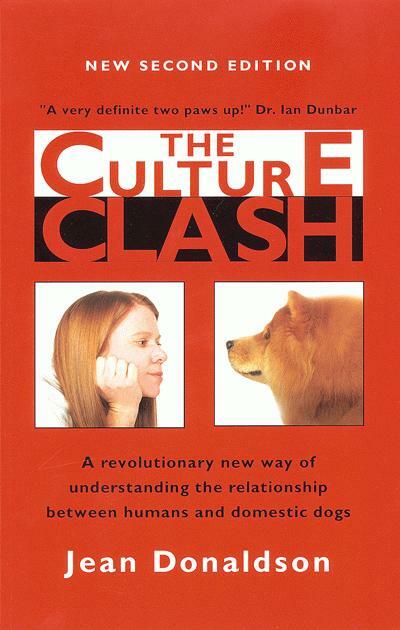 If you share your life with dogs, you owe it to yourself and your canines to pick up a copy of Jean Donaldson’s book The Culture Clash. It will give you new and amazing insight into dog behavior that will provide you with ideas of how to improve your relationship and understanding of your best friend. The book emphasizes training but it is very basic. The everyday dog owner can learn a great deal about dog behavior from this book even though they might not be interested in obedience competition. Donaldson starts by exploding the popular “Walt Disney dog” myth that suggests that dogs are moral, extremely intelligent beings that are capable of understanding and solving complex problems. For years, we have believed that dogs think, feel and act like humans. The truth (supported by scientific research) is that although dogs are great learners, they do not think abstractly, do not have morals, do not understand language, and cannot move mentally forward and backward through time. Therefore, many of the previous training methods and approaches to understanding dog behaviors are built on misinformation. Donaldson also explains the “eager-to-please” fallacy–the idea that our dogs are dying to do as we wish and furthermore know what we want of them. Again, this is based on our anthropomorphic vision of dog behavior and intelligence. Dogs learn by the immediate consequences of their actions. Dogs are self-interested. If there is something in it for them, they will do it. If there is nothing in it for them, they require motivation. “The Dominance Panacea” is another myth that Donaldson takes apart. Ever since humans discovered pack order in wolves, dog owners have been explaining every conceivable dog-dog and human-dog interaction in terms of dominance. “Dogs misbehave or are disobedient because they haven’t been shown who’s boss.” How many times have we heard that? Donaldson believes that this viewpoint amounts to yet another opportunity for punishment-based training methods. Behind a dog that rushes through doorways first, fails to come when called, or pulls on its leash is a human who has not taught the dog what is inappropriate. In other words, we should rule out lack of training before we immediately assume the dog is planning a coup of our leadership. Other important behaviors can be understood when you recognize that dogs are predators. Predatory behavior results in searching, stalking, rushing, chasing, biting, and dissection. Furthermore, the dog is a pack animal and is programmed to be constantly around others to survive. Separation from the group activates behaviors that help reunite with the pack These behaviors include agitation, distress vocalizations, scratching, digging and chewing. To say that this book has been eye-opening for me is an understatement. Donaldson’s frank and often humorous descriptions of dog behavior have challenged my beliefs and values to their very core. I highly recommend this book to anyone who’s interested in moving beyond the “Walt Disney dog” myth and seeing a dog for what it really is…and isn’t.